Is there a way to not output the Job name / step details and column headers? sqlcmd -Q"set nocount on; select * from sys.databases;"  -S localhost -D master -o  "c:\temp\test3.csv"
If using POWERSHELL is an option, you can change the job type to POWERSHELL and use INVOKE-SQLCMD. A possible downside to this approach is because ConvertTo-CSV automatically surrounds output columns with double quotes. The follow script handles the elimination of ALL double quotes and also removes the header from the results. Not the answer you're looking for? Browse other questions tagged sql-server sql-server-2014 sql-server-agent csv or ask your own question. How to succesfully run a batch file in an SQL Agent job? How to use sqlcmd to create file names for output based on the day of the week or the date? 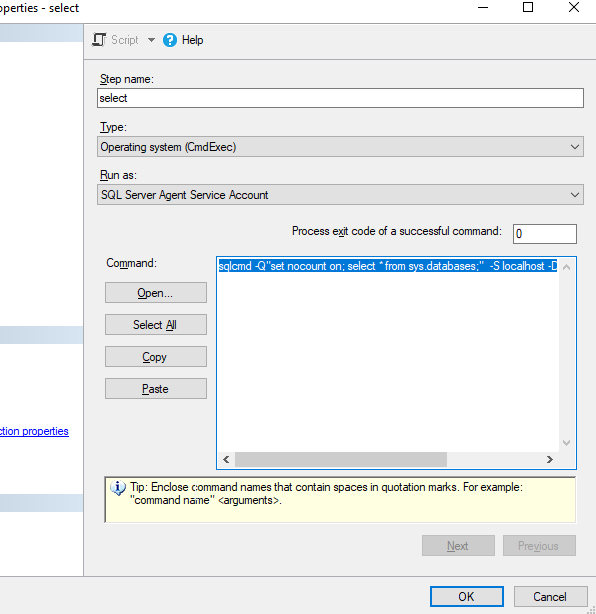 Where is the default location for the SQL Agent Job step output file? How do I update it?